KATHMANDU, March 15: Stating that Chief Justice Gopal Parajuli had already received his retirement on August 5, 2017 as per his personal credentials, Judicial Council Secretary Nripa Dhwaj Niraula Wednesday handed him a letter of retirement at a time when the judiciary is facing a serious crisis. Citing Section 31(7) of the Judicial Council Act 2017, Secretary Niraula handed the letter to CJ Parajuli and also informed various state authorities about the CJ’s retirement. 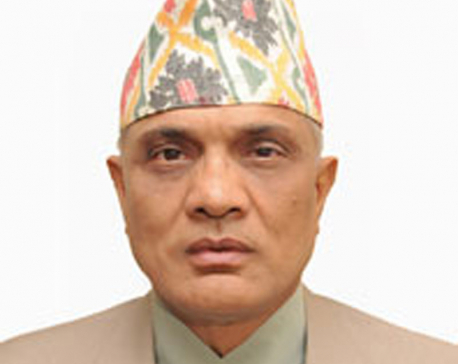 Stating that he received an academic certificate on Wednesday from the Office of the Comptroller of Examinations at Sanothimi, Bhaktapur citing his date of birth based on which he should have taken retirement on August 5, 2017 on completing 65 years of age, Niraula said he took the secretariat level decision in this regard on Wednesday itself and informed the CJ about it. This is the first case in the judicial history of Nepal in which a CJ has been relieved simply though a letter from the Judicial Council. If any judge is taking retirement due to age bar, the secretary needs to inform the judges and other authorities accordingly, as per Section 31 of the Judicial Council Act, 2017. Niraula claimed that he had performed his duty accordingly. Under the Constitution of Nepal, the chief justice and other justices of the SC should take compulsory retirement after completing 65 years of age. “I acted according to the provisions of the law,” Niraula told Republica. “I have the authority to inform the judge concerned about the retirement of that judge and therefore I informed Parajuli accordingly,” he added. Interestingly, Parajuli had transferred Niraula to the Commission on Inquiry of Disappeared Persons last year from the position of registrar of the Supreme Court. He was transferred to the post of secretary of the JC only two months back. Prior to administering the oath of office to President Bidya Devi Bhandari, the JC secretary had informed Parajuli of his retirement, he said. He also informed various other authorities – the Office of the President, Constitutional Council, Office of the Prime Minister and Council of Ministers, Supreme Court, Ministry of Law, Justice and Parliamentary Affairs, Civil Personnel Records, Employees Provident Fund, Civil Investment Trust, SC Seniormost Justice Deepak Raj Joshi and JC members Ram Prasad Sitaula and Padam Vaidik. Sources close to Parajuli claimed that the letter issued by the JC was illegal and unacceptable. 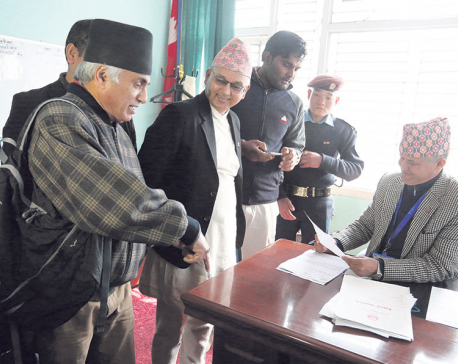 “He said he would not accept it and would challenge it,” Kishor Paudel, SC media advisor, said. He however did not clarify how Parajuli would challenge the letter. According to highlyplaced sources, Parajuli also tried to call a meeting of the JC on Wednesday evening to nullify the letter of the JC secretary, but no other members were ready for a meeting except Ram Prasad Sitaula. “He could not even notify Prime Minister KP Sharma Oli, who holds the law portfolio, Senior Justice Joshi, and JC members Sitaula and Vaidik,” the source said adding, “Others were not ready to hold the meeting and Sitaula alone would not be sufficient for the meeting,” he added. Seniormost Justice Joshi, however, declined to comment on the recent development. “I shall work as per the need of the hour,” he added. According to the JC letter, Parajuli got his retirement seven months ago and the decisions he made to date and the perks and facilities he enjoyed after that are also in question. Legal circles are surprised over the letter . “The letter does not have any legality,” senior advocate Yadu Nath Khanal, who is also a former president of the Democratic Lawyers Association, said. “The secretary does not have such power and there must be some grand design against the judiciary,” Khanal added. According to him, the letter does not have validity without first invalidating the decision of the JC of last May, based on which Parajuli should retire only 45 days later. Senior advocate Shambhu Thapa, however, said the JC secretary has the authority to inform any judge about his or her retirement because the JC is a separate, independent and autonomous body for keeping records relating to judges. “The JC is a separate institution. Henceforth its secretary can inform the CJ about his retirement,” he added.